[dropcap size=big]N[/dropcap]aama Kates is maddeningly difficult to pin down. She refuses to categorize her sound, relying instead on the descriptions applied by listeners. In fact, it’s hard to tell if there’s even a specific sound she’s striving for, admitting to the constant evolution of her music. She isn’t even sure that she’ll still be a singer-songwriter five years from now. Kates is as ethereal and whimsical as her music; yet, it’s this intangibility that makes her so attractive, as an artist and as a person. She is a mystery waiting to be solved and a hidden treasure that begs to be discovered, and soon audiophiles everywhere will have another opportunity to welcome Kates into their musical libraries with her sophomore album King for the Day . It was during that transition period that Kates’ artistic path was altered, and she stopped pursuing acting, opting instead to nurture her musical inclinations. “I didn’t study much formally,” she confesses, “I took some piano lessons for a couple of years as a kid. And then I think in adulthood – 17 and on – I kind of floated through different arts. I didn’t really know – I still don’t know – what I wanted to do. I didn’t necessarily even want to be in the arts, really, but my love for it and appreciation for it started as a kid.” Kates had danced ballet when she was younger, and the dancers were always accompanied by a piano. “I always loved it. I always liked singing along to music; it made me really happy.” Today, the piano is the instrument on which she writes and performs music. Kates’ first album The Unexamined Life debuted in 2012, and comprised the very first 12 songs she had ever written. “Writing each song is different,” she explains of the writing process, “you’re not aware that it’s gonna be an album of a particular length or that anything is going to go into it…. Once each song is written that feels like a shedding of something; it feels good.” Ironically, Kates didn’t really know why she had written these songs and had no aspirations to create an album. It wasn’t until she had met the man who would ultimately produce the record that the project took shape. Of course, those early days were learning experiences. “I used to be really nervous,” Kates says. “I didn’t know what I was doing, you know, when I was first doing it. I’m amazed at how badly I played and allowed myself to perform when I started going to open mikes with my own stuff.” She consumed a lot of alcohol to help her get on stage, but it didn’t help much. “I would still be nervous, just slower,” she laughs. 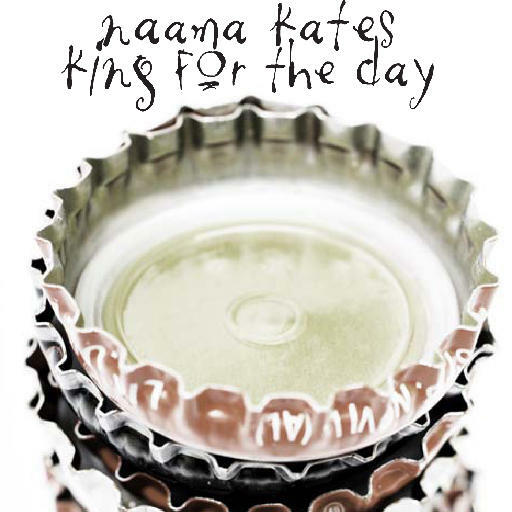 ‘King for the Day’ by Naama Kates. And it’s that level of rigid, complete honesty that will enthrall listeners. King for the Day is less about being catchy, and more about capturing the truth in any fleeting moment. So when the album inevitably ends, it’s a jarring experience, and listeners will be hard pressed not to restart the record and lose themselves in Naama Kates’ music once more. King for the Day is available on March 12, 2013. Follow Naama Kates on her website www.naamakates.com.